The early settlers of Israel looked towards their roots for musical inspiration. For many this meant the tones and tunes of Eastern Europe. However, there were were also those who wanted to create a new style of music that would belong uniquely to Israel and reflect their new country. The songs written in this new “Israeli” style combined familiar Eastern European motifs, traditional Sephardic melodies and more exotic Middle Eastern and North African influences. For many these more “Eastern” exotic influences seemed closer to biblical music and reflective of the land of Israel. This new musical style is generally known as Mizrahi music. A pioneer of this new style of Israeli music was Josef “Jo” Am ar. A noted Moroccan-born Israeli singer and hazzan, Amar began his singing career in the late 1940s in Morocco before he moved to Israel in 1956. 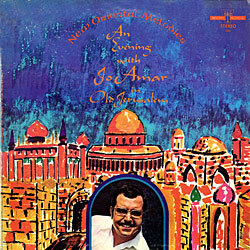 Jo Amar’s love of Arabic music was strong and he made several recordings in Arabic. But it was his Hebrew recordings which introduced Mizrahi music to mainstream Israeli culture and was responsible, to a great extent, for its growing popularity. By 1970 he was living in New York singing professionally as a well-known cantor. He spent the last two decades of his life in his beloved Israel where his artistry brought him many honors and awards.